Due to the recent increase in crude oil prices and concerns over diminishing conventional reserves, the Utah Geological Survey has reexamined the Uinta Basin’s oil shale resource, primarily in the Mahogany zone of the Green River Formation. We created conversion equations by correlating available Fischer assays with corresponding density and sonic measurements as a way to predict oil yield from geophysical logs. In addition to the core-based Fischer assays obtained from 107 wells drilled specifically for oil shale, 186 oil and gas wells with oil yields calculated from digitized bulk density or sonic logs were used to create a basin-wide picture of the oil shale resource in the Uinta Basin. These widespread data were used to map oil shale thickness and richness and create isopach maps delineating oil yields of 15, 25, 35, and 50 gallons of shale oil per ton (GPT) of rock. From these isopach maps, new basin-wide resource numbers were calculated for each richness grade. The Utah State Energy Program (USEP) has been allocated almost $9.6 million from the U.S. Department of Energy’s (DOE) Energy Efficiency and Conservation Block Grant (EECBG). Dr. Jerriann Ernstsen, manager of the EECBG program, urges local governments to start planning now to help prevent communities from missing the funding opportunity application period, which will have a very narrow window of time to apply. The project types will focus on energy efficiency retrofits, on-site renewable energy systems, traffic and street lighting, and other related projects. Utah has been awarded $14.1 million today, toward an eventual sum of $35 million. “Utah is one of 10 states to receive millions of dollars for energy efficiency and renewable energy projects from the U.S. Department of Energy’s (DOE) Recovery Act,” said Jason Berry, manager of the Utah State Energy Program. Energy Secretary Steven Chu today announced more than $204 million in Recovery Act funding. In order to be eligible for funding from DOE’S State Energy Program (SEP), states must have proposed statewide plans that prioritize energy savings, create or retain jobs, increase the use of renewable energy, and reduce greenhouse gas emissions. This initiative is part of the Obama Administration’s national strategy to support job growth, while making an historic down payment on clean energy and conservation. During the night of August 4, 2008, Utah lost a popular giant when Wall Arch, a prominent arch along the Devils Garden Trail in Arches National Park, collapsed. While not the largest or most famous arch in the park, Wall Arch was still a favorite due to its proximity to Landscape Arch along the always-busy trail. With a measured span of 55 feet, it was ranked as 12th largest in the park (some publications and Web sites give the span as 71 feet – this is actually the “breadth”, a dimension that is not useful for comparing arches). While no arch lasts forever, it is still extremely rare to see such a dramatic example of “geology in action.” We do not have a good geologic tool for dating arch formation, but we are sure that Wall Arch had stood nearly unchanged for hundreds, and probably thousands of years. Geologic Information: The sandstone layer in which the pinnacles, pillars, arches, and knobs of Fantasy Canyon are formed consists of ancient river channel sediments. The underlying and overlying rock layers sandwiching the sandstone layer, and creating scenic badland topography around the canyon, are finer grained floodplain deposits. During the Eocene Epoch, 55 to 34 million years ago, the Fantasy Canyon area was at the fringe of a vast subtropical lake – Lake Uinta – that at peak level stretched from the Wasatch Plateau to western Colorado. The lake was in a drying phase and retreating westward by the end of the Eocene. Geologic Information: The area around Cascade Springs is underlain by coarse-grained glacial sediment deposited when glaciers covered high elevations of the Wasatch Range approximately 30,000 to 10,000 years ago. Beneath the glacial deposits, bedrock consists of Cambrian-age (about 500 million years old) quartzite, shale, sandstone, and limestone. These rocks were transported eastward 30 to 50 miles during low-angle faulting on the Charleston-Nebo thrust fault around 80 million years ago. As a result of the faulting, the bedrock in the vicinity of the springs is tilted and highly fractured. Through the use of computers and the Internet, and virtual globes such as Google Earth, we now have a way around the inherent limitations of depicting the third dimension on a standard paper geologic map. To help users gain this 3-D advantage, the UGS created an overlay of the new geologic map of the St. George 30′ x 60′ quadrangle in southwest Utah. This 3-D visualization brings the map to life, dramatically showing the relationship between geology and topography. A virtual field trip for the St. George 30′ x 60′ quadrangle, which uses placemarks to highlight selected geologic features, was also created. 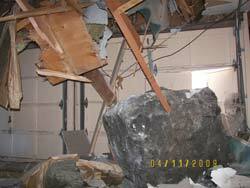 Around 11:30 a.m. on April 11, 2009, a rock fall impacted the area of 1500 North and 1550 East in Provo, Utah. One rock-fall boulder damaged the outside of a playhouse located at 1522 North 1550 East, and another, larger boulder severely damaged a vacant house at 1496 North 1550 East. The April 11, 2009 rock fall occurred one lot north of the May 12, 2005 “Y” Mountain rock fall. The rock fall occurred shortly after a storm on April 8-9 that dropped 1.5 inches of precipitation in less than 18 hours at the Cascade Mountain Snotel site, 3 miles southeast of the rock-fall source area. 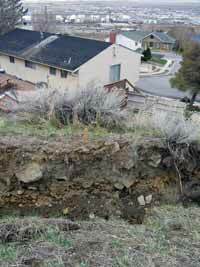 Impact craters (bounce marks) evident on the slope above the houses indicate several rocks traveled downslope. The rocks traveled an estimated one mile downslope, and likely achieved high velocities as they bounced and rolled. The American Recovery & Reinvestment Act (ARRA) was signed into law as of February 17, 2009. Portions of the ARRA energy funds will be directly administered by the Utah State Energy Program (USEP).